You already know that a strength training regimen with a qualified personal trainer can improve your cardiovascular health. We’ve written before about how there isn’t much difference to your body between “cardio” and “strength” exercises, and that both can bring great health and heart benefits. Strength training can help your heart, but did you know that it can help you tackle that other monster, high blood pressure? High blood pressure, or hypertension, is when the pressure against the walls of your blood vessels and arteries is too high. If the high pressure is maintained over a long period of time, this causes damage to your circulatory system that can lead to serious health problems down the road, like a heart attack or a stroke. 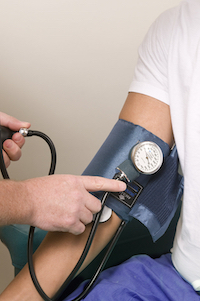 How Can Strength Training Reduce Your Blood Pressure? 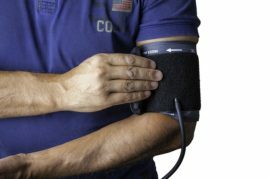 Although the scientific literature isn’t 100% in agreement on why exactly exercise lowers your blood pressure, there is strong evidence to support that a strength training regimen can help attack your high blood pressure in several ways. A strength training regimen can help slow and even reverse some of the negative health outcomes caused by aging. Strength training helps you maintain a healthy weight by increasing your metabolically active tissue, which increases your metabolism. Strength training can also lower your stress levels and improve certain aspects of your mental health. High blood pressure is known as “the silent killer”, because there are no real symptoms that show. The only way to find and diagnose high blood pressure is to take the average of several blood pressure readings taken at different times, such as at your regular physical checkup exam. Call us at Vertex Fitness to talk to a trainer about how you can add a strength training regimen to help manage your blood pressure.